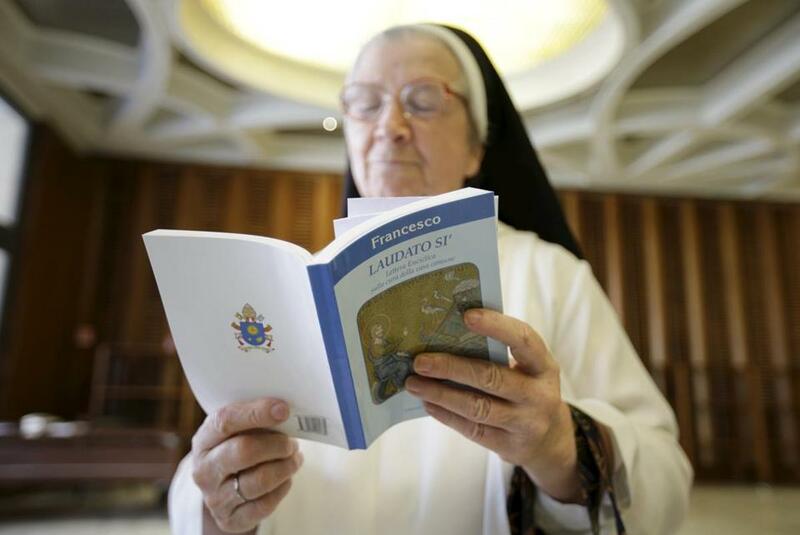 A nun read Pope Francis&apos; encyclical titled “Laudato Si” at the Vatican in 2015. The Archdiocese of Boston’s headquarters — a brick building in a desert of parking lots and busy roads in Braintree — is about to become a green energy oasis. Before the end of the year, a canopy of solar panels is set to be installed over the asphalt parking lot, with the capacity to generate a megawatt of electricity. That’s enough to offset 900 tons of carbon dioxide emissions annually — approximately the amount that 37,500 trees absorb each year, by the estimation of one environmental group. The solar field, which will reduce the building’s energy costs an estimated 50 to 70 percent, is designed as a pilot that can be replicated in parishes across the archdiocese. The inspiration is as much spiritual as financial: The project is the most ambitious example of the archdiocese’s response to Pope Francis’ call to action on climate change two years ago in his letter to the worldwide church, “Laudato Si” (Praise Be). Other efforts are bubbling up as well: In Boston, some parishes have set up “Creation Care” teams that are focused on recycling, making churches more fuel-efficient, and educating parishioners on reducing fossil fuel consumption. The archdiocese is helping parishes install LED lights and energy-efficient appliances, and it has mostly divested from the fossil fuel industry. Catholic schools in Boston have woven environmentalism into their curriculum. Cardinal Sean P. O’Malley, the archbishop of Boston, underscored the importance of the encyclical by scheduling a lengthy briefing for priests shortly after its publication, said John Straub, chancellor of the archdiocese. “The guidance at that [gathering] was, ‘Go, do,’ ” Straub said. But some environmentalists say the church in Boston and around the country needs a more organized and urgent response to a grave global crisis that speaks directly to the church’s core teachings on the value of life. The bishops should be challenging members of Congress who are climate-change deniers, dispatching busloads of Catholic schoolchildren to climate-change demonstrations, and issuing demands for action from the pulpit, Carolan said. “If the bishops said, ‘This is a top issue for us, you can’t claim to be right-to-life if you’re wrong on this issue,’ then I think it would have an impact,” he said. Tomás Insua, a research fellow at Harvard’s Kennedy School of Government and the founding global coordinator of the Global Catholic Climate Movement, a coalition of 400 Catholic organizations, said the American bishops have made progress but need to do more, faster. Bishops and priests, he said, should start by making all the buildings of the Catholic Church more energy-efficient. And they should talk constantly about the issue, urging Catholics to transform their personal habits and advocate for change. Bradley Campbell, president of the Conservation Law Foundation, a leading New England environmental advocacy organization, said local Catholic leaders are not visible enough in climate-change policy debates. But church officials say they are working on multiple fronts to respond to the pope’s call. The US Conference of Catholic Bishops says it has made teaching and advocating about ecology and environmental degradation an explicit priority, working with a partner organization, the Catholic Climate Covenant. The conference has developed educational resources for clergy and laity; in 2016, its “‘Laudato Si’ in the Parish” program reached 300 priests and deacons in six dioceses, according to Ricardo Simmonds, an environmental policy adviser to the bishops. Prelates across the country, including O’Malley, have issued statements on climate change policy. Some dioceses have launched ambitious programs. In Burlington, Vt., Bishop Christopher Coyne, a former Boston church official, has designated a “Year of Creation,” featuring events about ecological justice. In March, for example, Coyne led a series of Scripture readings and reflections focused on environmental stewardship, followed by a soup supper where participants learned about how fasting from meat can benefit the environment and the poor. The Archdiocese of Atlanta, in collaboration with scientists from the University of Georgia, rolled out a Laudato Si action plan designed to help parishes and parishioners cut fossil fuel consumption. Committed activists from around the Archdiocese of Boston are trying, too. 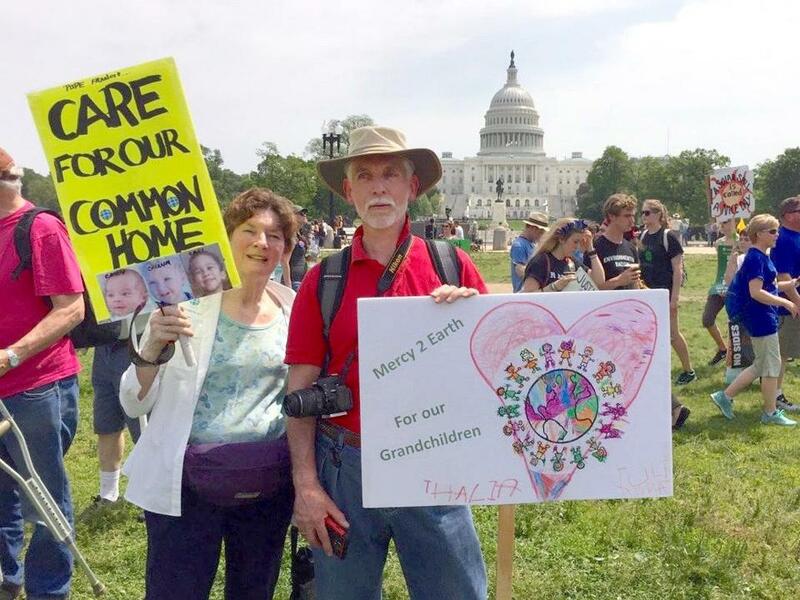 Boston Catholic Climate Movement steering committee members Fran Ludwig and Pete Dunbeck participated in a climate march in Washington on April 29. Fran Ludwig, an organizer of the Boston chapter of the Global Catholic Climate Movement, said her group hopes to adapt the Atlanta plan for the Boston archdiocese and has drawn representatives from about 30 of Boston’s 289 parishes to its “Greening Your Parish” workshops. Her own parish, Sacred Heart and St. Brigid in Lexington, held a prayer walk and Green Mass on Earth Day this year; their pastor, Monsignor Paul Garrity, devoted a special homily to the themes of Laudato Si. Laypeople should be leading the movement, Ludwig said, but support from priests is key. And though her own pastor has been supportive, others lack the capacity to devote to the issue because they are pressed for time and working at multiple parishes. “A lot of them are so fixed on the nuts and bolts of trying to bring these parishes together,” Ludwig said. At the Paulist Center, a Catholic community run by the Paulist Fathers in downtown Boston, a small “Care of our Common Home” ministry encouraged parishioners to carpool to Mass for Laudato Si’s first anniversary and is making arrangements to buy solar energy, said Trudy Macdonald, a parishioner who said Laudato Si motivated her to join her community’s recycling committee and work to pass a local plastic bag ban. But she said the archdiocese should take a stronger stand. But church officials say O’Malley prefers to steer away from top-down, heavy-handed approaches. Terrence Donilon, spokesman for the Boston Archdiocese, said parishes are working as quickly as possible, given the challenge of stretched resources. He also pointed to parishes such as Holy Family in Concord, which hosted four educational programs this spring exploring the themes of Laudato Si and is hoping to integrate the encyclical into its religious education program. But Jack Clarke, director of public policy and government relations for Mass Audubon, said the archdiocese could move more quickly and effectively if O’Malley appointed someone whose sole job was putting Laudato Si into action. “Unless there are people appointed to implement the message and work with government, it’s inspirational words on paper,” he said. Clarke served a decade on the Parish Council at Holy Family Parish in Gloucester and Rockport, and is now a eucharistic minister and acolyte. He said the parish and pastor have had their hands full since finding massive leaks in the bell tower of 125-year-old St. Ann Church in Gloucester; the church, it discovered, was slowly falling apart and would require $1 million in repairs to save it. The pastor, meanwhile, is overseeing two parishes that encompass three churches and a chapel. No one, Clarke said, has yet found the time to establish a Creation Care committee. 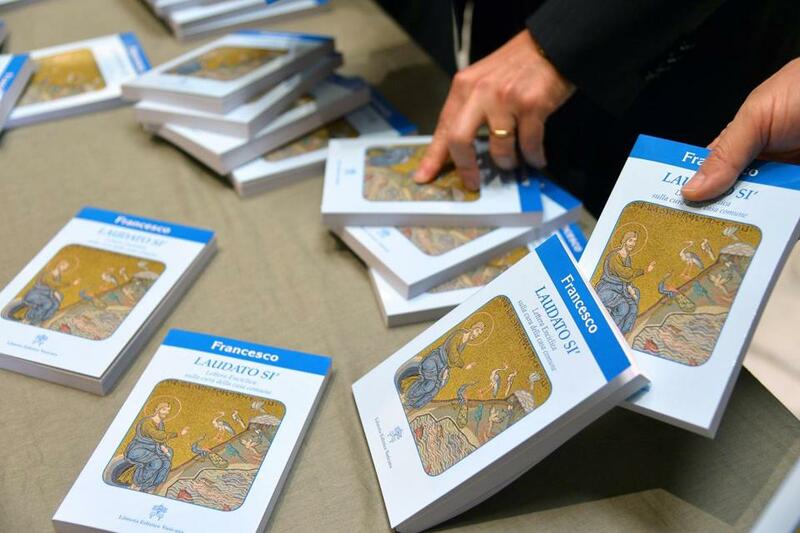 People held copies of “Laudato Si” in 2015, during its official unveiling at the Vatican.